Thank you for your enthusiastic support and partnership as we work together on what may be our community’s greatest challenge — bringing back a healthy Lagoon. It is my honor to work with you on this goal and I am humbled and inspired by your efforts every day. Too much pollution has been channeled to the coast through our waterways and it’s taking a tremendous toll on our environment and quality of life. We are fortunate to have outstanding individuals and groups who are taking the lead to solving this crisis by setting an example in Indian River Lagoon coastal communities. Each year we honor just a few of the many, many lagoon heroes working cooperatively to bring our estuary of national significance back to health. (Please view the award categories, nominees, & winners listed below.) With this event, by honoring them, we honor all of you working to save our lagoon. Rejoicing in past successes and inspiring hope for the future, we are pleased to announce that over 65 sponsors/contributors, over 7 volunteers, and 117 attendees of our 2019 Annual Conservation Achievement Awards Banquet raised over $17,000 for MRC’s vital work to improve our Lagoon’s water quality. Thank you! Click any photo for a larger image, or click here to view all photos from this event. These talented and dedicated conservationists are identified by the MRC Membership and honored through a nomination process. Voting Has Ended. The winners will be announced during the ceremony. For information on becoming an official member of the Marine Resources Council please visit http://bit.ly/2y2T0ZQ. 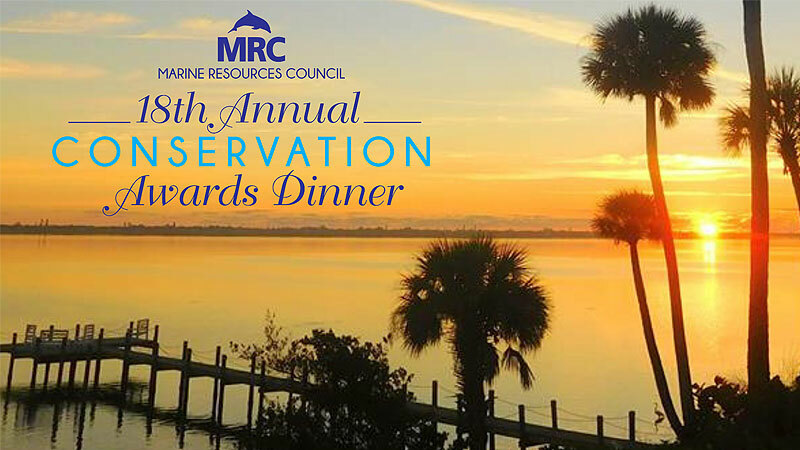 Help us celebrate the 18th Annual MRC Conservation Achievement Awards Banquet to honor extraordinary Indian River Lagoon conservation heroes. This is an evening of famed speakers, unique art, wine, spirits, live music, and delectable food in recognition of our esteemed partners and individuals who have helped shape some of today’s most crucial lagoon conservation wins. Proceeds benefit the Marine Resources Council’s efforts to protect and conserve our cherished Indian River Lagoon. This formal event is open to the public. Each ticket includes 2 complimentary adult beverages and choice of entree (Jumbo Lump Crab Cakes, Chicken Mediterranean, and Roasted Vegetable Lasagna). Mark Perry, Executive Director of Florida Oceanographic Society / President of the Rivers Coalition, Inc.
For those attending from the south end of the Lagoon, FOR AN EXTRA FEE, a shuttle will be available for you to ride to and from the Awards Dinner with Maggy Hurchalla! The shuttle will depart from the Publix Super Market at Seabreeze Shoppes (900 NE Ocean Blvd, Stuart, FL 34996) in Stuart at 3:30 pm and depart the Awards Dinner at 9:00 pm following the festivities. Special Need: Seeking Sponsors and Live Auction Items! We are seeking to offer beach/vacation, fishing/boating experiences and other special items in our silent/live auction. Sponsorships start at $100. Please view available sponsorship opportunities at http://bit.ly/2GwlZM6. To discuss event sponsorship, and in-kind donations including auction items, please contact Steve Sharkey at SharkeyMRC@gmail.com or 321-978-8862. These exclusive sponsorship opportunities below help us deliver high quality and unique elements to the event. In return for your generous sponsorship, you will find recognition benefits associated with each level. Your company name on invitations, event program, event signage and flyers as the printing sponsors (Deadlines apply). Your staff can also volunteer at the event registration table. Your company name prominently placed at the bar where many guests will partake of some signature wine & spirits. Company name/logo will be prominently placed on the step and repeat banner, which is a publicity backdrop used primarily for event photography, printed with a repeating pattern such that brand logos or emblems are visible in photographs of the individuals standing in front of it. Your name will be featured during the live auction presentation and on materials to and package descriptions featured online and in email communications. Friday, March 1: Deadline to be listed as a printing underwriter on invitations. Friday, March 15: Deadline to get artwork in for event program ads. Deadline to be listed as a printing sponsor on event program. For additional information on event sponsorship, underwriting, and in-kind support, please contact Steve Sharkey at SharkeyMRC@gmail.com or 321-978-8862. Register Online Now at (Direct link: http://bit.ly/2GwlZM6). Remit a Check by Mail Payable to Marine Resources Council (Please write “Awards Sponsor” in the memo line and include a phone number.) at 3275 Dixie Hwy NE, Palm Bay, FL 32905. Please Support Local Businesses That Support Our Lagoon!